EWB-Colorado Springs Professional Chapter (EWB-COS) along with Cadets from the EWB -Air Force Academy Student chapter (EWB-AFA) adopted the Suncallo project in 2009. Suncallo is a community of 100 families located in the mountainous area above the Altiplano. 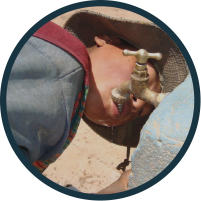 Suncallo community leaders identified their top priority to be increasing the capacity of the present drinking water system in order to provide service to the entire community. In May 2009 they did their Assessment trip. 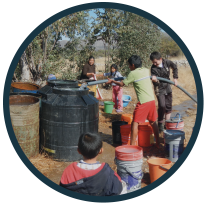 They found the people of Suncallo getting all their water through an aging 1 inch polyethlyene pipe that runs down the mountainside from two little springs, and eventually goes to tap stands outside most of the homes. The pipe was supported by “sticks” as it crossed the ravine. The people at the far end of the pipeline don’t get much water when the people closer to the springs are using their taps, which is basically all morning and all afternoon. 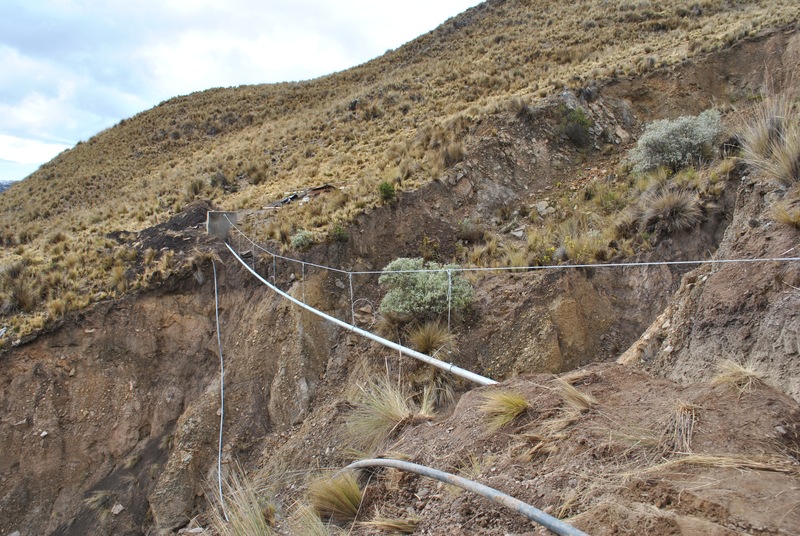 In May of 2011 EWB-COS returned to Suncallo with the goals to 1) build a suspension system to support the fragile main water line across a ravine and to 2) set up a storage reservoir to collect the overnight water as a buffer during the day. Two EWB-COS members came from the US and worked with Marcos and Afnan from EIA. Unfortunately they didn’t accomplish near the amount of things they had hoped. There was a donkey shortage (for carrying materials up to the site), not as much support as we had anticipated from the community, and they had to leave a couple of days early because of a road blockade. This is where EIA showed its unique ability. EIA negotiated with EWB-COS to go back and finish up the construction work. First, we discovered that there were misconceptions in the community about who would own the project once completed. As soon as the community realized it was the whole community’s system, we had plenty of support. The community had been told to complete a concrete slab to hold the water tank and it had been built and cured by the time our guys arrived. 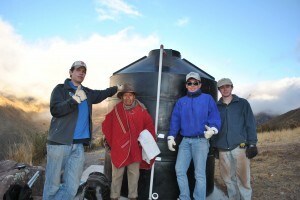 We sent Marcos, Afnan, and our two interns (Eric and Jacob) to Suncallo to work for 5 days to complete the project. In three days, thanks to all of the help they received from the community, they were able to place the storage reservoir on the pad and connect it into the water system. They were also able to finish the piers supporting the cable and run the cable support across the large ravine. Then they suspended the much sturdier pipeline, connected everything and it all worked without any significant leaks. “Thank you so much for finishing up the work we started a couple weeks ago!!! It was very exciting to wake up and see the pictures of the storage reservoir actually on the pad and connected into the water system and to see those piers supporting the cable and the much sturdier pipeline. I’m so glad to hear that the final assembly process went pretty smoothly for you, though it looks like the weather had turned even cooler. I wish we could have been there with you to help out and to celebrate the completion. It was hard to leave with the project unfinished and so it is especially satisfying to see those pictures and to know that the residents of Suncallo now finally have a reliable and adequate drinking water system. We’ll be anxious to hear more details in the coming days, after you thaw out in La Paz, and learn more about how the project went and what the community sees as their next priorities at this point. Again, thanks for making this project a reality!! !